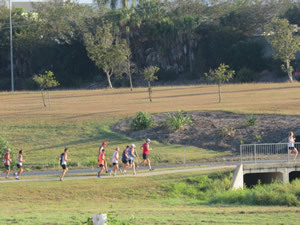 As Mackay Road Runners’ official season draws to a close, over twenty runners enjoyed the second last social run last Sunday morning from the spectacular Botanic Gardens precincts. Club President, Tim Magoffin welcomed the very social crowd to partake in a 5km or 10km loop course through the meandering trails including scenic vistas of the Lagoons’ abundant array of fauna and birdlife. Those enjoying the fresh morning included ultra-marathon runner, Wayne McMurtie who decided to tackle the short course option after his recent magnificent Run for Resilience 1500km ultra marathon journey from Brisbane to Winton in support of Post Traumatic Stress Disorder (PTSD). The epic twenty two day event assisted in raising funds for PTDS Resurrected for returned soldiers to access resources to aid themselves, their families and first responders to overcome trauma experienced in the Army. The Run for Resilience aids Veterans who need support transitioning back into civilian life after the high pressure/high noise environment they experienced in high volatile areas of conflict. Last week, a civic reception was held for Wayne at the Jubilee Park, Mackay where the Mackay Mayor, Cr Greg Williamson, Local Government Members, Mackay Regional Councillors, official dignitaries from local and state RSL and Reserve Army were in attendance. 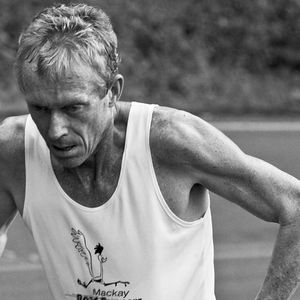 Mackay Road Runners are very proud of Wayne and his very significant contribution to this very worthy cause. Congratulating Wayne at the Jungle run were runners Tim Magoffin, Ross Connor, Simon Henderson, Stuart Sprott, Geoff Neale, Ricky Parker, Mark Takagaki, Jo Skinner, Carolyn Steginga, Andrew Short, Jeanette Farrugia, Jose Short, Jo Hughes, Leanne Connor, Janelle Tilse, Craig McGahey, Colin Hardy, David Isbister and Steve Oberg.